The fourth and last ship of Ada class corvettes, F-514 TCG Kınalıada was launched today, after 8 years and 9 months since first indigenous warship TCG Heybeliada left the slipway. 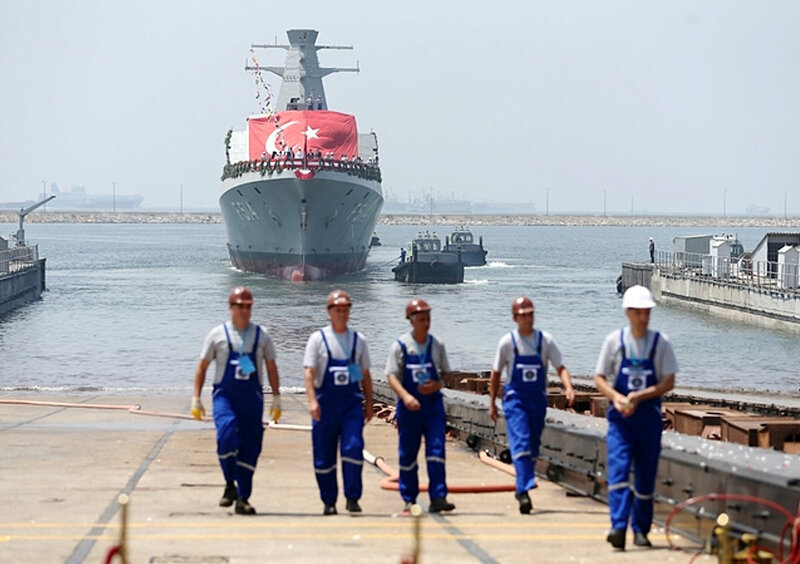 Today also marked the start of a new era of Turkish warship construction. The first module of the frigate TCG Istanbul was laid on the slipway. The first steel of the frigate was cut on 19. January 2017. The first model of the ship was constructed during the last 6 months. As Tuzla Naval Shipyard has only one slipway to accommodate new buildings, the launching of TCG Kınalıada created space for the frigate. TCG İstanbul will be the prototype of the second generation of the Milgem class warships. There will be four of them: TCG İstanbul, TCG İzmir, TCG İzmit and TCG İçel. They are a modified version of Ada class corvettes. They will be about 14 meters longer but will have the same width as Ada class. The frigates will be 600 tons heavier. Construction of TCG İstanbul is expected to be completed within the next 46 months with the intended commissioning date is 2021. I wish TCG Kınalıada fair winds and following seas.